Living in Toronto, or at least living close enough to get there by bus, it's pretty hard to walk around the city without bumping into some kind of construction. What an eyesore! 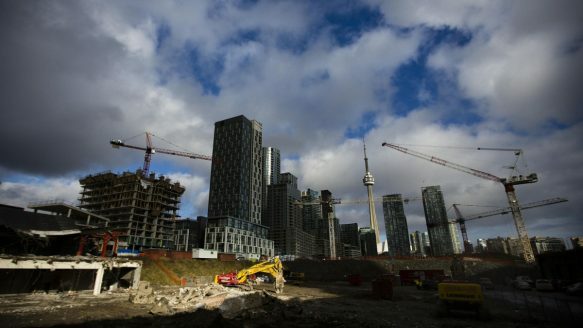 I mean, I know that construction is inevitable and it's the only way we can get to that image of the 'perfect city' that we all dream about, but it's turning this beautiful metropolis into an unsightly place full of caution tape and pylons. Check out this bus terminal in my own little slice of the Greater Toronto Area. Merely the starting location in my voyage downtown, and I've already hit construction. What's the deal with that pylon? Is it covering something? It seems lonely, stranded in the middle of nowhere with no one to tell its problems to. Moving further into the heart of the city, the skyline is littered with cranes, all rushing to get their condominium up and built before the others. 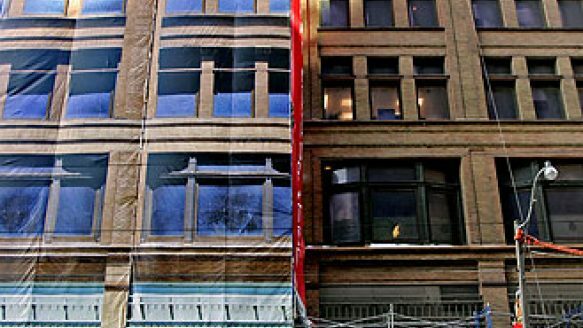 Borrowing an idea from many European stores that are undergoing their own makeovers, this creative cover manages to trick the eye (kind of) into believing that no changes are being made to the building. It's like a sandwich! The slices of bread are the real building underneath and the imprinted cover overtop, with the construction workers and scaffolding hidden inside as the meat. While construction is arguably necessary to improvement, it doesn't have to make Toronto streets look like some kind of dump site. With a little bit of creative thinking, we can really have our cake, and eat it too. The covers can also act as advertisements, which are not as pleasing to the eye but get the job done, and probably at a cheaper cost. And hey, cheaper means more people might adopt it! I would prefer advertisements to construction any day. Then again...would I? I'm not quite sure which is the greater evil. These kinds of coverings pay homage to the trompe l'oeils (meaning "to deceive the eye") that originated in Renaissance painting. Magnificent castles of ye olde would have "windows" painted onto solid brick walls to create the illusion of a view to a lush field (ever present, even in Winter). While all things ugly must exist in this world, it doesn't mean we can't cover them up with something a little easier on the eyes. And if it's going to be too much makeup on the face and too many advertisements lying to us about every product under the sun, it can surely be a lovely piece of architecture as well.